Mike McGehee is president and CEO of Pryor-based Williams Construction, which has worked on projects for American Castings, BOK Center and GRDA. He earned a degree in petroleum engineering from the Colorado School of Mines and has been with the company for 10 years. 1. Williams Construction has been around for more than 60 years. What’s the secret to the company’s longevity? We are in our third generation of Williams-family ownership, and I would have to say one of the main reasons for our 64 years of continued success is having consistently maintained our core focus of improving the lives of our clients, our employees, their families and the community throughout our years of being in business. We take great pride in being honest, reliable and professional with our clients and their specific needs. 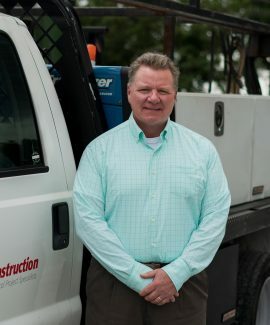 We have adapted to an ever-changing construction market and environment in our area, while maintaining an exceptional contractor-client relationship throughout the entire construction process. 2. What kind of projects does Williams Construction work on? We seek highly challenging, critical construction and industrial maintenance projects in many industries: aerospace, petrochemical, powergeneration, pulp-paper, food processing, fertilizer and manufacturing, to name a few. With high safety and quality standards always being a priority, along with a highly skilled and responsive workforce, we excel with technical, high-risk and tightdeadline projects. With an employee-combined construction experience of almost 600 years, we are able to offer an exceptional depth of knowledge and an extraordinary range of skills and expertise to alleviate the complexity and stress of the project for the client. 3. Your company prides itself on its team-based approach to projects. How does that come through in your work? From the initial contact with a client to the final close-out, each of our projects is a collaborative effort by all departments to bring an ontime and under-budget experience for our customer while maintaining our reputation of safety, quality and professionalism. The success of this philosophy and approach is evident by the fact that 90 percent of our clients are repeat customers. Also, we are one of just a few general contractors in the region that self-perform a large percentage of the work on our construction projects. This allows us be more efficient in scheduling and project managing, along with the increased potential for cost savings, the ability to control quality and to better ensure a safe project work environment. 4. What do you look for when you’re hiring new employees? New employees, along with our current staff, must exhibit our company’s core values. The moral attributes of integrity and trustworthiness must always be at the forefront. They must seek to always improve their skills through continuous learning and self-improvement. They must be intelligent risktakers who exhibit a calculated, confident, ambitious and responsible strategy when making decisions and evaluating opportunities. Lastly, they are compassionate about the company, our clients and their fellow employees. 5. Is there one project that stands out for you because of its challenges? What did Williams do to make it successful? It’s difficult to say there was just “one” project that stands out, as we’ve had many challenges over our 64 years. As “The Critical Project Specialists,” we thrive and excel with those projects that few can — and will — do because of the challenges and risk involved. … This truly sets us apart from the traditional general contractor. We mitigate these challenges with a thorough risk assessment during the estimating and preconstruction phases of a project by utilizing our 600 years of employee-combined construction experience for collaborative input and analysis. During the construction phase of a project, the process is further enhanced by our experienced and engaged project management, safety and construction support services groups.